On Saturday, March 24th, it will be 50 years. Alice Guy Blaché b. July 1, 1873 – d. March 24, 1968. She was the first woman film director and the first to make fiction films before women had the right to vote according to Alison McMahon, Alice Guy Blache Lost Visionary of the Cinema, Alice Guy developed narrative film stories at a time when it really didn’t exist. Born July 1, 1873, to French parents, her father owned a chain of bookstores in Chile and her mother returned home to give birth to Alice in Saint-Mandé. They returned to Chile for her early years, remaining there until an earthquake destroyed her father’s bookselling business. While she and her sisters were sent to a boarding school in Convent du Sacré-Coeur, Viry, France 1879–85 for a strict Catholic education, her father encouraged Alice to learn a practical skill so she can always support herself. Taking up stenography, Alice was hired as a secretary by Leon Gaumont for his still photography company in 1894. Gaumont allowed Alice to learn the new technology as long as it didn’t interfere with her secreterial duties. In her spare time, Alice experimented using inventions and techniques for still photography integrating into moving pictures. She became head of production for the Gaumont Film Company between 1896 to 1906 and directed her first film, La Fee aux Choux (The Cabbage Fairy) in 1896. Using Gaumont’s “chronophone,” she made her first sound synchronized and colorized films around 1900. In doing so, Alice Guy became the first woman filmmaker in the world, directing at least 324 films. 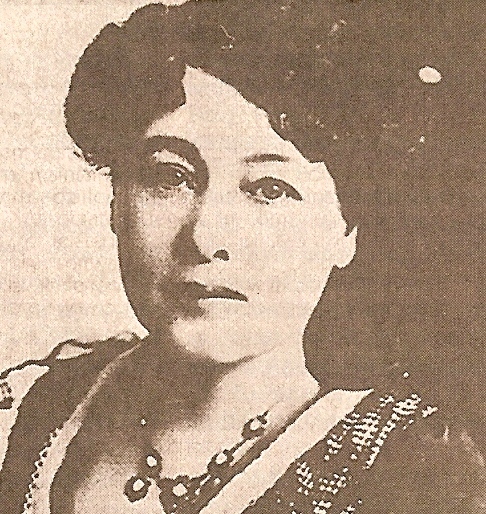 Alice Guy married Herbert Blache in 1907 and were sent to start up Gaumont’s Chronophone (sound synced talking film system) business in America. However, American filmmaking and exhibiting seemed behind the times, and it took another three years before Alice creates her own studio, Solax, renting Gaumont’s underused studio space. She gives birth to a daughter, Simone in 1908 and son, Reginald in 1911 when the Solax Company was formed on Lemoine Avenue in Fort Lee, New Jersey. By 1912, the entire studio and factory, Solax Company, was planned, owned and operated by Madame Alice Guy Blaché. It was completed with an outlay of $100,000 and had all departments. It was large enough to accommodate five stage settings, a shipping department for finished products to be shipped for distribution including printed posters and marketing materials. There were laboratories and dark rooms for film development; a projection room to check product; drying rooms capable of drying 6,000 feet of film at a time. The accessory department included property rooms, scene painting, carpentry shop, costume design. As a director for twenty-eight years, Alice Guy Blaché accomplished things that no one was doing at the time– special effects, super imposition, synchronized sound films between 1902 and 1906. Up until 1912, she was the only woman film director who was producing a consistent body of work in the world. Herbert Blaché’s contract with Gaumont expired in 1913 and Alice Guy makes him president of Solax so that she can concentrate on writing and directing. After three months, Blaché resigns and starts his own film company, Blaché Features using Solax Company’s factory, inventory and actors eventually superseding Solax production, so that by 1914, Solax Company is virtually defunct. Things go downhill following several bad business deals as well Herbert’s move to Hollywood with Catrine Calvert, an actress, who starred in four films that Alice Guy directed. After eventual bankruptcy and final divorce proceedings, Alice Guy Blaché returns with her children to France in 1922. Despite her successes, efforts to work in the French film industry do not bear fruit. She returns to the U.S. in 1927 to find copies of her films, but finds none, not even at the Library of Congress where some were copyrighted. When the silent film era ends in 1929, it becomes clear that she will not make films again. She becomes financially dependent on her children, especially her daughter, Simone. From 1947-1952 Simone and Alice Guy live in Washington D.C. In Georgetown, she begins to seriously work on her memoirs and filmography, and renews the search for her films. She also begins a correspondence with Louis Gaumont, Léon Gaumont’s son and in 1954, Louis Gaumont gives a speech in Paris on “Madame Alice Guy Blaché, the First Woman Filmmaker” whom, he says, “has been unjustly forgotten.” Film historians such as: Jean Mitry, Georges Sadoul, René Jeanne and Charles Ford begin to take notice of her and in 1955, Alice Guy is awarded the Légion d’Honneur, France’s highest nonmilitary honor. On March 16, 1957, Alice Guy is honored in a Cinémathèque Francaise ceremony which goes unnoticed by the press. In 1963, Victor Bachy, the professor who initiated the academic study of cinema in Belgium, meets Alice Guy by accident and begins researching her work. By 1965, Alice Guy and Simone move to Mahwah, New Jersey. On March 24, 1968, Alice Guy Blaché dies in a nursing home at the age of 95 and is buried at Maryrest Cemetery in Mahwah. By 1976, Alice Guy Blache’s memoirs were published in French, with a filmography by Francis Lacassin. The Memoirs of Alice Guy Blache translated by Roberta and Simone Blaché and edited by Anthony Slide was published in 1986. Publication of Victor Bachy’s Alice Guy-Blaché: La Première femme cinéaste du monde in 1994 and Alice Guy-Blaché: Lost Visionary of the Cinema by Alison McMahon in 2002. In 2011, Director’s Guild of America bestowed a Special Directorial Award for Lifetime Achievement upon this pioneer filmmaker, Alice Guy Blaché, in recognition of her groundbreaking career as the first female filmmaker and the first filmmaker to develop narrative filmmaking. On July 1, 2012, due to efforts by members of the Fort Lee Film Commission, supporters and friends, a new marker at Maryrest Cemetery reads: Alice Guy Blache – First Woman Motion Picture Director; First Woman Studio Head; President of the Solax Company, Fort Lee, New Jersey. Susan Lazarus, New York Women in Film & Television (NYWiFT) Women’s Film Preservation Fund.